Last week, I blogged about the Talbotype of Lieutenant John Irving, which surfaced in the collections of the City of Edinburgh, and which I tentatively identified as the work of Hill and Adamson. 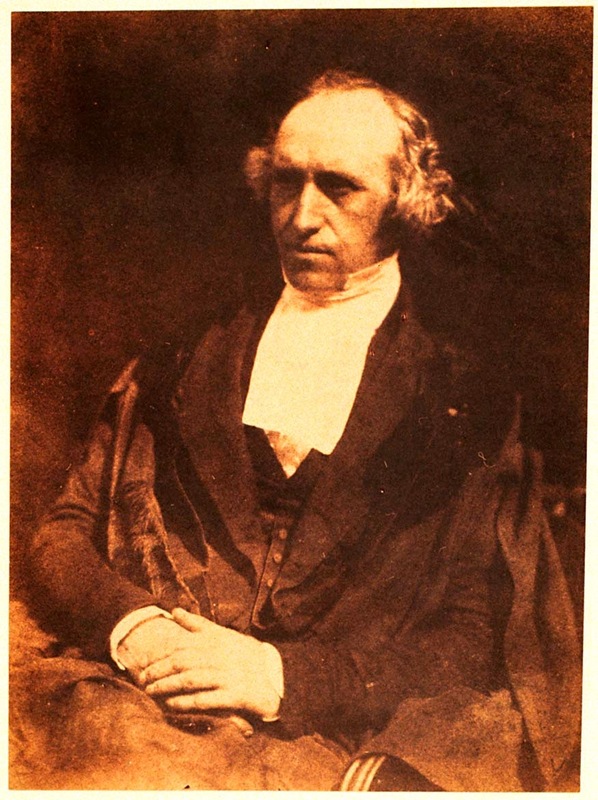 It occurred to me that John's brother, the Reverend Lewis Irving, might be the link between them, since Hill had photographed all of principal figures who broke off to form the Free Church of Scotland in the 'Great Disruption,' among which Lewis Irving was prominent. Frustratingly, the good Reverend's name came up blank in all of the indexes of major collections of Hill and Adamson's work. Fortunately, I then stumbled upon an M.Phil. thesis by one Roderick Duff Simpson. Simpson had gone through the large collection of copies on glass plates left behind at Hill and Adamson's studios in Rock House in Edinburgh, which are now in the collection of the University of Glasgow. Mr. Simpson identified one of these plates -- HA0291 -- as a portrait of the Reverend Irving, one which in the University's database is still listed as "unknown man." Despite his baldness, the resemblance is a striking one, with a similar aquiline nose and puffy lower eyelids. The photograph was taken by Hill as a study for his great painting of the Disruption, which features the heads of hundreds of men then present. According to Simpson, though, this particular photo was not the source used in the painting, which suggests that there are other images of Lewis Irving yet to be found. I'm in the process of trying to contact Mr. Simpson, but in the meantime am happy to share this image, courtesy of the University of Glasgow, Special Collections.